MINNEAPOLIS—Christopher Slinde, a lifetime Minnesota Vikings fan who has endured decades of heartbreak and lots of overpriced beer in supporting his team, believes Vikings fandom is priceless. According to economists, it's worth $530.65. "This is deep," said Mr. Slinde, a 33-year-old X-ray technician, outside the Park Tavern near Minneapolis on Sunday. He had been handed a recent economics paper that is tattooed with equations and attempts to value, in dollars, the joy and pain Minnesotans get from the Vikings. "Don't economists spend their time on more serious stuff?" he asked, after thumbing through the paper in the cold. As fans pack stadiums and couches to watch the National Football League's divisional playoffs this weekend, they care about victory. Economists are tackling a more abstract challenge: putting a price on the emotional benefits of having a pro sports team in town. The worth of fandom may seem theoretical, or even silly. But it's serious business for teams like the Vikings, who want Minnesotans to help them pay for an $870 million stadium to replace the Hubert H. Humphrey Metrodome in downtown Minneapolis. The Vikings' Metrodome lease runs out in 2011 and the team says it won't sign an extension without a deal for a new stadium. The team hasn't explicitly said it will bolt without a deal. But it insists the Metrodome cannot support a modern NFL franchise. So, many fans are convinced that without a new stadium, the Vikings will take their quest for football greatness to a warmer state with no Nordic heritage. Sports teams sell their facilities as economic-development projects that create jobs and generate tax revenue. But a slew of studies have shown that publicly subsidized stadiums—usually paid for by selling bonds and paying the cost and interest with tax revenue–rarely return the money governments put into them. Teams continue to argue, often successfully, that they are worthy of subsidies because they are a source of civic pride and purpose. But what is that worth? Economists Aju Fenn and John Crooker tried to answer the question in a study published in July 2009 in the Southern Economic Journal. The two used "contingent valuation methodology," which is a nerdy way of saying they surveyed people and used statistical models to turn the answers into an average price Minnesotans place on the Vikings. The result: The Vikings' "welfare value" is $702,351,890— $530.65 for each of the roughly 1.32 million households in Minnesota. The study was conducted in 2002, and the figures are not adjusted for inflation (or for the recent acquisition of quarterback Brett Favre). You couldn't touch that money. It's an abstract figure meant to catch everything from the joy of donning blond braids and Vikings horns to the feeling of pride that even nonfans get from living in a "major league" city. In the broadest sense, Mr. Crooker says, "welfare value" represents the worth Minnesotans place on having the Vikings in Minnesota. It's tough putting a price on feelings, which is why some economists are skeptical of contingent value studies. "It's not that this is capturing nothing, it's just that it's not legitimate to interpret people's answers as if folks were spending their own money," says Peter Diamond, an MIT economist. He co-authored a 1994 paper titled: "Contingent Valuation: Is Some Number Better Than No Number?" Mr. Fenn, chair of the department of economics and business at Colorado College, got the idea for his Vikings study 10 years ago, while teaching a sports economics class at the University of St. Thomas in St. Paul. The Vikings had a new owner so then, as now, fans were worried the team would leave. Other economists have used contingent valuation to measure the social benefits of professional teams. But Mr. Fenn believed fears of a Vikings departure would produce a more accurate tally of the value Minnesotans get from their purple and gold team. 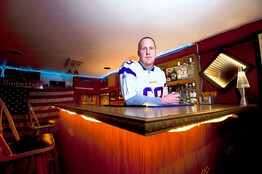 Brian Sand, an ardent Minnesota Vikings fan, in the basement lair where he watches games with his friends. Minnesotans are no strangers to sports abandonment. In 1960, the Minneapolis Lakers basketball team moved to Los Angeles, a city not known for its lakes. The Minnesota North Stars hockey team became the Dallas Stars in 1993. So, on a fall evening before a 1999 Monday Night Football game, Mr. Fenn and some students went to a Metrodome parking lot to survey tailgaters. Some fans whipped out their checkbooks to make the point that they would pay on the spot to keep the Vikings in town. (No donations were collected). The drunker fans got, the more they were willing to pay, Mr. Fenn observed. Survey questions were fine-tuned by the Metrodome experience. In the 2002 off-season (to minimize in-season emotions), Messrs. Fenn and Crooker mailed 1,400 surveys to households across Minnesota, capturing both fans and nonfans. The study's figures were based on the mail surveys, which had 30 questions ranging from demographic information to how much time the person discussed the Vikings at home and at work. But the so-called welfare value was generated from a single yes or no question: Would you be willing to pay $X out of your own household budget for the next year to make a new stadium possible? There was one price on each survey (it ranged from $5 to $100). Mr. Fenn cautions that the $702 million welfare value doesn't mean that helping the Vikings with a stadium would be the best use of the state's tax dollars. "We're not suggesting that the state of Minnesota act a certain way, or that voters support [a new stadium], or not support it," he says. "We're just pointing out that the Vikings mean a lot to the average Minnesotan." You don't need a doctorate in economics to discover that the Vikings mean a lot to Brian Sand, a Minneapolis police officer. He watches games in a basement lair he calls "Jerseys" for the four framed and autographed Vikings jerseys hanging on the walls. On a recent Sunday evening, Mr. Sand was seated on the Jerseys couch with his fiancée, Emily Johnson, eating chocolate-chip cookies and chuckling as the Vikings' archrival, the Green Bay Packers, lost their championship hopes on an embarrassing fumble. If he had to, Mr. Sand guesses he would spend up to $500 a year to keep the Vikings around. As a kid, he devoted his Sundays to church and the Vikings, and the team still helps him get through the cold Minnesota winters. "This state is a Viking state," says Mr. Sand. Mr. Slinde, the X-ray technician, says he'd be out of a hobby if the Vikings left town. No more tailgating in the cold or watching games at bars or at friends' houses. No point in listening to sports talk radio. The only benefit Mr. Slinde can see is that if Vikings left town, he'd save a lot of money.